Nexus Speakers > Left Centre Right speaker for TVs. 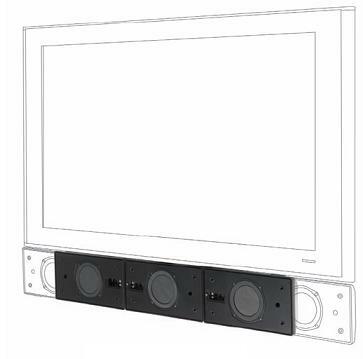 Uniquely, the front left, centre and right channel speakers (LCR) fit any flat-screen television (from 37” to 50” screen size). The LCR speakers are fitted to a telescopic frame**, which can also be attached to the Q Acoustics universal table stand, floor stand or cantilever wall bracket. The frame extends or contracts until the LCR speaker perfectly matches the width of the television. The frame also adjusts back and forward, up and down, until it again matches the television. When all the adjustments are made, the speaker ‘disappears’ because it simply looks as if it is an original part of the TV – even the Q Acoustics badge is magnetic, for easy removal. For more information please download brochure here.